Diabetes mellitus, an endocrine disorder, affects glucose metabolism, which takes place either when the pancreas does not produce enough insulin or when the body cannot effectively use the produced insulin. Among one of the four noncommunicable diseases, diabetes has been found to be an important public health problem which is focused and targeted by worldwide researchers. Over the past decades, the incidence and prevalence of diabetes have been doubled, which are responsible for many adverse complications. Globally, as per the estimation in 2014, around 422 million are affected by diabetes as compared to 108 million in the year 1980. Since 1980, 4.7%–8.5% rise of diabetic patients among adult population has been observed, which is considered to be doubled globally (age-wise standardization). This reveals an increase in related risk factors such as being overweight or obese. Over the past decades, diabetes prevalence has been prone to affecting more in low- and middle-income countries than in high-income countries. It is estimated that by 2025, there will be >572 million cases of diabetes mellitus. Diabetes is mainly divided into two types: Type 1 diabetes and Type 2 diabetes. The management of Type 1 diabetes depends mainly on insulin, whereas the management of Type 2 diabetes is mainly using oral hypoglycemic agents. Diabetes is a metabolic syndrome, which causes a variety of comorbid complications and responsible for premature death. Comorbidities such as heart attack, stroke, kidney failure, leg amputation, vision loss, and nerve damage have been observed. Uncontrolled diabetes in pregnancy may lead to severe complications and fetal death. Currently, there are several numbers of insulin preparations available whose onset and duration of action can widely vary. Unfortunately, the manual administration of the insulin is essentially an estimated therapy. Mostly, this insulin administration unfortunately includes common side effects such as nausea or an upset stomach. This leads to a weak immune system and additional other complications, which becomes difficult to control. Insulin is incapable to pass through the gastrointestinal membrane as it gets broken down by the gastrointestinal tract. Insulin injections are taken subcutaneously; also, two antidiabetic drugs are taken simultaneously, which in general increase the risk of side effect. Patient compliance would be better if the route of administration of insulin is easier and less painful. Gastrointestinal and nasal administration of insulin was not successful as it gets inactivated in the gastrointestinal tract. However, insulin inhalers were developed and approved. There is a concern with insulin nasal administration as it could get deposited in the intra-alveolar spaces and could decline the pulmonary functions. Hence, other routes of administration are being explored which would be more effective in patient compliance and profound health. Production of insulin in natural form is very tedious and difficult; also, the available method could not either reproduce or qualitate the peak insulin levels. Restrictions on an oral route of administration of insulin; discomfort, trauma and lack of compliance in injectable form have led the researchers to initiate research towards transdermal route of insulin administration. Transdermal route of insulin delivery provides an opportunity across the skin for various clinical implications. Thus, the current review enlightens the transdermal route of insulin delivery into the stratum corneum through microneedle (MN)-based technology. 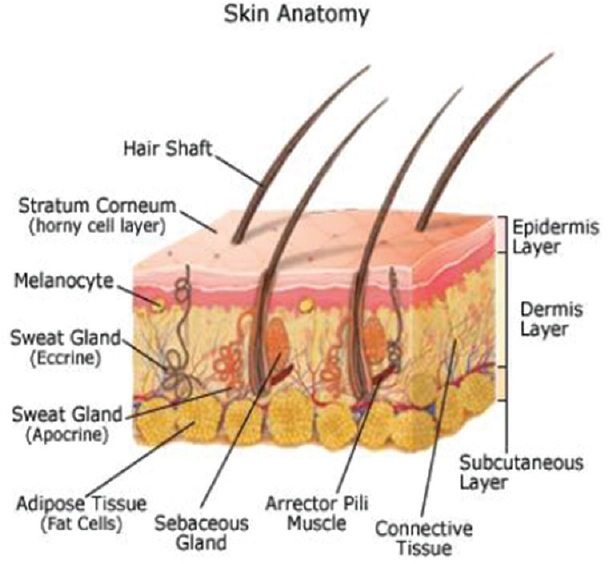 Physical barrier and a receiver of peripheral stimuli are the two main functions of the skin, which is mainly divided into three layers: the epidermis, dermis, and hypodermis or subcutaneous tissue, as described in [Figure 1]. The outermost layer of the skin is the epidermis, which is approximately 100-μm thick and mainly consists of a barrier part; stratum corneum that contains stacked dead cells, which are continuously replaced by new cells formed in the basal layer. The core dermis contains hair follicles, sweat gland, and blood vessels which are connected by nerve endings. The hypodermis contains an adipose tissue layer, which helps in thermal insulation that is around 1-mm thick. Hypodermis also serves as an energy source and is around 100-times thicker than the stratum corneum. This dermis comprises small vessels, which plays a major role in giving out drugs into the systemic circulation and also maintains temperature, which is defined as the skin's microcirculation. The function of the skin mainly involves in protecting the body from external harmful substances and microorganisms. Skin is the largest organ of the human body which is known to provide toughness and elasticity for body movement. The lipids in our skin protect us from electricity as it is a poor conductor of electricity. In fact, the stratum corneum provides the most significant barrier to diffusion, which approximately causes diffusion up to 90% of transdermal drug applications. On the other hand, to some minimal degree, it has been found that almost all molecules go through the skin. Transdermal drug delivery is a process where a drug is transported into the skin layer for systemic distribution. Patch-based drug delivery provides a unique and brilliant route of administration for the hydrophobic drugs into the skin. The skin's outer stratum corneum provides an impenetrable barrier for insulin drug delivery. To overcome this, micrometer-scale needle contains a unique technological approach to enhance drug permeation across the skin layer, which thereby enables better insulin delivery which would require infection for delivery. Transdermal drug delivery is a system where the specific, fixed, and controlled amount of drug molecule is enclosed in a system to be delivered into the intact skin surface at a predetermined rate into the systemic circulation. In recent years, transdermal delivery will gain remarkable triumphs to overcome several issues with drug development. Transdermal delivery of many drugs had been reported to surpass many limitations of oral, injectable, or inhaler mode of administration. It was also observed that around 74% of drugs administered orally were not as effective as needed for therapy. Transdermal drug delivery has arisen as a novel method of drug delivery for overcoming the issues linked with conventional methods of drug administration. In the USA market, around 51% of drugs among 129 compounds are under clinical evaluations which were screened for the transdermal or dermal system. The first transdermal system, named “Transdermal SCOP” for nausea and vomiting prevention, was approved in 1979 by the FDA, and now, the transdermal patch technology has peaked up to 2 billion in global market. Only limited transdermal drugs are available, despite having many benefits; also, among these, many of these have limited permeability across the stratum corneum. Dosing frequency will be reduced, and there will be improvement in patient compliance. As compared to an oral drug delivery and injectable, transdermal drug delivery has made a significant contribution in achieving the target. The use of iontophoresis in the transdermal system has also gained higher increase in lipophilic drug delivery. The current drug delivery system focuses on targeting stratum corneum through MNs and electroporation. Some of the marketed formulations based on MN are described in [Table 1]. The stratum corneum is considered to be lipophilic as it lies beneath the layer of the epidermis. It creates a barrier that causes resistance to a variety of drugs. Some vehicle is required to enhance the diffusion as the drug does not possess any physiochemical properties. Hence, various methods have been developed such as physical and chemical enhancers such as electroporation, sonophoresis, iontophoresis, and MN. Tiny microchannels via the stratum corneum layer are created by the use of the medical MN device, where these are found to be of various brands and variants. University of Marburg, Germany, investigated and found that MN approach enhances the skin penetration for both lipophilic and hydrophilic compounds. This MN approach has also been considered as “the vaccine of the future.” These MNs can be of variant types such as hollow, solid, coated, dissolving, or hydrogel forming, of which some have regulatory approval. MN devices/patches have also been successful in the field of nanomedicine in delivering nanoparticle medicines through MN. MNs are designed in such a way that it only penetrates the dermal layer of the skin without going deep and stimulating the dermal nerve. The MNs can be used in many ways as it is arranged in an array, to enhance the transdermal drug delivery. MNs are microscale needles that are assembled on the transdermal patch, which are considered to be a hybrid between hypodermic needles and transdermal patches basically to overcome both injections and patches. MN patch bypasses the stratum corneum without stimulating the dermal nerves because of the short length of needles. Miniature holes created by MNs deliver the drug into the body without causing irritation and pain in the skin. MN is pain-free, minimal invasive system which combines the advantages of traditional transdermal drug delivery system along with the targeting of conventional hypodermic needles. MNs create a micron-sized pore that is big enough to deliver the micromolecular-sized drug into the body. There are reports suggesting that the drug may be coated onto the MNs and administered into the skin. Some studies also suggest that a MN dissolves upon application and releases the drug safely without any side effects. Hollow MNs, on the other hand, are used to directly inject the dissolved drug into the skin. Currently, MNs are one of the latest approaches which are developed and designed through clinical trials, which would be used in the delivery of macromolecules such as insulin, parathyroid hormone, and influenza vaccine. MNs have been well-thought-out drug for effective transdermal delivery. This involves machineries like microelectronics that will penetrate 100 mm inside the skin layer without causing pain. The stratum corneum is the physical barrier which limits entry of many drugs, which can be breached by the application of MN technology. MNs are just like conventional needles, which are made in microscales and arranged in the form of arrays. Various reports have shown the use of silicon or metal MNs and also the use of dextrin, maltose, and glass. Furthermore, MNs can be fabricated in the form of patch system, which will be used for transdermal delivery. Most of the drugs at a desired therapeutic rate often fail to reach the layer of the skin; hence, transdermal drug delivery has limited success ratio. Thereby, the use of MN patches has been basically found to be beneficial in enhancing the skin permeability and efficient in increasing transdermal drug delivery. Extensive research in designing MNs had been explored in this field. This review highlights five main types of MNs, which are as follows: solid, coated, dissolving, hollow, and hydrogel-forming MNs. Solid MN development is an approach termed as “poke with patch” which involves a two-step process. In the first step, solid MN arrays are applied to the skin, which creates a miniature microchannel on the stratum corneum into which the drugs can be easily transported inside the body. The miniature microchannel increases the permeability of the stratum corneum through passive diffusion method. Solid MNs are made of silicon, metals, or polymers. Transdermal permeation of different molecules such as insulin, calcein, naltrexone, or proteins has been accelerated by the use of solid MN arrays as mentioned in a variety of published studies. MN arrays are often be recommended with other combination strategies like the use of iontophoresis, which will enhance the efficacy of transdermal delivery. Another approach termed as “coat and poke” which implies the use of solid MNs array coated with macromolecule (drug or vaccine). After application of MN onto the stratum corneum, the formulation which is coated onto the MN is deposited. Many strategies can be implemented for successful coating of the drug into the MN array. The coated MN has been beneficial for delivering macromolecules such as protein, nucleic acid, and vaccines into the skin. The use of coated MNs may prove a viable option for vaccination purposes or for the delivery of potent drugs, but this is not suitable for delivering large amounts of active molecule. Dissolving MNs are made of a soluble/biodegradable matrix that includes the active substance; the needle matrix dissolves into the skin after insertion and thereby delivers the drug. Micromolding techniques are used to produce this type of MNs. Commonly, these types of arrays are made up of sugars, carbohydrates, or synthetic polymers which can be used in the delivery of insulin, low-molecular-weight heparin, ovalbumin, adenovirus vector, vaccine antigens, photosensitizers, and precursors. Dissolving MN combined with iontophoresis is more effective in better delivery of the drug into the skin. Hollow MNs contain hollow needles through which the drug is delivered. Hollow MN, which is extensively used in insulin delivery, is made of varying materials such as silicon, metal, hollow glass, polymers, and ceramic. Hydrogel-forming MN arrays are MNs which contain a swelling material along with a drug reservoir. Both the swelling material and drug reservoir in the hydrogel-forming MN array defuse the drug by absorbing the interstitial fluid (ISF) through the swollen microprojections. Hydrogel-forming MN arrays are made up of synthetic polymers. Macro- and micromolecules can be distributed through hydrogel-forming MN. Microelectromechanical system is a microfabrication technology, which integrates mechanical element with sensor, actuators, and electronics on a silicon substrate. This technology will provide possibilities for integration of the complete system on chip which will use in better glycemic control and management. The advantage of parenteral approach is that it bypasses the body physical barrier and degradation and directly enters into the bloodstream. The length and dimension of MN is such that it reaches the capillary-rich layer of the stratum corneum to deliver the drug into the circulation. This technology will provide immense opportunity in the field of subcutaneous drug delivery as it has a pain-free and noninvasive manner of drug delivery approach. An insulin therapy system that involves automatic monitoring of glucose levels and also alters the injection therapy can indeed address many problems associated with manual techniques.,, In general, generic devices having the following parts are important, given as follows: (a) a glucose sensor system and (b) a feedback mechanism that forms a bridge for sensing the glycemic level and delivery of insulin. Among this, feedback mechanism plays an important role in the insulin therapy device. Glucose adsorption which triggers production of insulin is a very complex phenomenon. In general, the program should allow a patient-specific tailoring of glucose level versus insulin delivery scheme which may exactly match the real metabolic activities. Among these, closed-loop system using a MN has gained a great interest in diabetes research because of its characteristics that have higher priority. Only application- and algorithm-dependent MNs exist. MN consists of highly application-specific design and involves multiple parameters to be considered. Various characteristics are always important such as fragility, biocompatibility, penetration, force, fluid flow rate, ease of fabrication, and cost. Blood glucose levels can be sensed either by sampling blood or ISF. Many studies highlight the difference in glycemic levels in blood and ISF.,, The time gap is usually observed to estimate the range of 0–45 min to distribute glucose from blood to ISF. Although noninvasive glucose monitoring has greatly modified, the techniques used still lag many complications due to the devices that rely basically on the inexact mathematical algorithms. Traditional methods, on the hand, employ hypodermic needles which have been found to highly undesirably painful and tissues traumatic. MNs can solve these problems as it can cause minimally invasive skin interface tool. Delivery of insulin transdermally is considered to be difficult, as the molecule is very large (~50 A in diameter), which makes it incapable of passing through the stratum corneum. Insulin can be delivered into the stratum corneum by creating miniature pores by MN technology. Recently, glucose oxidase an enzyme has been used in MN along with insulin, which acts as a glucose sensor, which detects the hypoxia in the blood and releases insulin inappropriate amount and time. The delivery component is pumped which is controlled by a feedback mechanism. The dependence of capillary force is removed by the active pumping action. Hence, material choice plays an important role based on the degree of hydrophilicity. Various types of MNs have been used such as polymer,, metals,, silicon dioxide,, and silicon. The lumen diameter of MN tip should be between 10 and 100 μm for a pain-free appropriate insulin delivery into the stratum corneum. For fluid infusion, flow rate of >1 ml/h for a single MN has been demonstrated. Even at minimal/slow rates, a needle array can transfer easily definite amount of dosage via MN. Insulin delivery using a MN has been proved to reduce glucose levels, which has shown successful results in animal models. Around 47%–80% reduction in glycemic levels was observed in studies when 0.05–0.5 units of insulin were delivered through MN technology. During the insertion of insulin by MN, it can be speculated that MN can occasionally get clogged or trapped in the stratum corneum during the procedure. Employing numerous needles, it typically minimizes the influence of individual needles' failure or passage blockages. The use of array formation has been found to increase fluid flow rates. With the more number of MNs arranged in the array makes the linear flow rate of insulin into the stratum corneum. Around 100 MNs can be arranged and placed in 200 μm apart dimension of the array. Insulin delivered through MN would be pain free and for an extended period of time. This makes it more frequent delivery of short half-life insulin possible into the stratum corneum. MNs should be reliable and strong enough to withstand repeated penetration and extended use, and failure could lead to incorrect administration of doses. Due to its continuous use requirements, the degree of biocompatibility also plays an important role. The silicon is more versatile for MN construction, but the biocompatibility varies when in use compared to certain other metals. Although silicon is found to be versatile for MN fabrication, its degree of biocompatibility may vary. Biodegradable polymer-based MN should be explored. Some researchers believe that the quantitative control and continuous delivery of insulin via the auxiliary pump system requires maintaining more amount of insulin whereas in case of MNs it can be maintained through less volume of insulin. In a traditional therapy scheme, slow-acting infrequent administration of insulin takes longer time to show its effect in diabetic patient. Controlled injections over an extended period of time might deliver short half-insulin more frequently; thus, insulin concentration can be maintained. MN either in the form of patches or arrays has been found to be a rational approach for the effective delivery insulin through the transdermal method in better management of diabetes. MN approach is pain-free, effective, and safe route of drug delivery as compared to other injectable methods. These painless systems are slowly gaining importance and would also qualify to be one of the important devices for the controlled drug release in the future. Autonomous diabetes therapy systems have highly complex interdependencies, thus assuring multidisciplinary research initiatives. The developments of a noninvasive, bioengineered interface, such as MNs, can definitely be implemented, which provides a better understanding of the skin. Relatively, the use of painless insertion may reduce the risk of patient's noncompliance and human error. Furthermore, it is speculated that the use of MN has gained much demand because of its minimal training concept which can be very beneficial toward diabetic children. Thus, MNs are a feasible option to improve glycemic control, could set the stage for improved and more comfortable diabetes management, and reduce the risk of long-term diabetes complications. Hence, it is concluded that MN-based technology by transdermal delivery is far superior and effective than other injectable in better patient compliance and management. The Author gratefully acknowledges the fellowship received from Indian Council of Medical Research (ICMR), New Delhi (Ref. No. 45/38/2018/MP/BMS) for carrying out research in this field. Khanna P, Strom JA, Malone JI, Bhansali S. Microneedle-based automated therapy for diabetes mellitus. J Diabetes Sci Technol 2008;2:1122-9. Hultström M, Roxhed N, Nordquist L. Intradermal insulin delivery: A promising future for diabetes management. J Diabetes Sci Technol 2014;8:453-7. Akhtar N. Microneedles: An innovative approach to transdermal delivery – A review; Int J Pharm Pharm Sci 2014;6:18-25. Silpi C, Manish B, Kumar TR. Microneedle-based automated therapy for diabetes mellitus. IRJP 2011;2:72-8. Yu J, Zhang Y, Ye Y, DiSanto R, Sun W, Ranson D, et al. Microneedle-array patches loaded with hypoxia-sensitive vesicles provide fast glucose-responsive insulin delivery. PNAS 2015;112:8260-5. Larrañeta E, McCrudden MT, Courtenay AJ, Donnelly RF. Microneedles: A new frontier in nanomedicine delivery. Pharm Res 2016;33:1055-73. Hovorka R. Continuous glucose monitoring and closed-loop systems. Diabet Med 2006;23:1-12. Renard E. Implantable closed-loop glucose-sensing and insulin delivery: The future for insulin pump therapy. Curr Opin Pharmacol 2002;2:708-16. Steil GM, Panteleon AE, Rebrin K. Closed-loop insulin delivery-the path to physiological glucose control. Adv Drug Deliv Rev 2004;56:125-44. Spencer WJ. A reviewed of programmed insulin delivery systems. IEEE Trans Biomed Eng 1981;28:237-51. Kulcu E, Tamada JA, Reach G, Potts RO, Lesho MJ. Physiological differences between interstitial glucose and blood glucose measured in human subjects. Diabetes Care 2003;26:2405-9. Stout PJ, Peled N, Erickson BJ, Hilgers ME, Racchini JR, Hoegh TB, et al. Comparison of glucose levels in dermal interstitial fluid and finger capillary blood. Diabetes Technol Ther 2001;3:81-90. Boyne MS, Silver DM, Kaplan J, Saudek CD. Timing of changes in interstitial and venous blood glucose measured with a continuous subcutaneous glucose sensor. Diabetes 2003;52:2790-4. Kaushik S, Hord AH, Denson DD, McAllister DV, Smitra S, Allen MG, et al. Lack of pain associated with microfabricated microneedles. Anesth Analg 2001;92:502-4. Friedl KE. Analysis: Optimizing microneedles for epidermal access. Diabetes Technol Ther 2005;7:546-8. Wang PM, Cornwell M, Prausnitz MR. Minimally invasive extraction of dermal interstitial fluid for glucose monitoring using microneedles. Diabetes Technol Ther 2005;7:131-41. Tsuchiya K, Nakanishi N, Uetsuji Y, Nakamachi E. Development of blood extraction system for health monitoring system. Biomed Microdevices 2005;7:347-53. Gattiker GE, Kaler KV, Mintchev MP. Electronic mosquito: Designing a semi-invasive microsystem for blood sampling, analysis and drug delivery applications. Microsyst Technol 2005;12:44-51. Caduff A, Hirt E, Feldman Y, Ali Z, Heinemann L. First human experiments with a novel non-invasive, non-optical continuous glucose monitoring system. Biosens Bioelectron 2003;19:209-17. Henry S, McAllister DV, Allen MG, Prausnitz MR. Microfabricated microneedles: A novel approach to transdermal drug delivery. J Pharm Sci 1998;87:922-5. Park JH, Allen MG, Prausnitz MR. Polymer microneedles for controlled-release drug delivery. Pharm Res 2006;23:1008-19. Park JH, Allen MG, Prausnitz MR. Biodegradable polymer microneedles: Fabrication, mechanics and transdermal drug delivery. J Control Release 2005;104:51-66. Davis SP, Martanto W, Allen MG, Prausnitz MR. Hollow metal microneedles for insulin delivery to diabetic rats. IEEE Trans Biomed Eng 2005;52:909-15. Chandrasekaran S, Frazier AB. Characterization of surface micromachined metallic microneedles. J Microelectromech Syst 2003;12:289-95. Rodriguez A, Molinero D, Valera E, Trifonov T, Marsal LF, Pallares J, et al. Fabrication of silicon oxide microneedles from macroporous silicon. Sens Actuators B Chem 2005;109:135-40. Rajaraman S, Henderson HT. A unique fabrication approach for microneedles using coherent porous silicon technology. Sens Actuat B Chem 2005;105:443-8. Wilke N, Hibert C, O'Brien J, Morrissey A. Silicon microneedle electrode array with temperature monitoring for electroporation. Sens Actuators A Phys 2005;123-124:319-25. Martanto W, Davis SP, Holiday NR, Wang J, Gill HS, Prausnitz MR, et al. Transdermal delivery of insulin using microneedles in vivo. Pharm Res 2004;21:947-52. Perennes F, Marmiroli B, Matteucci M, Tormen M, Vaccari L, Fabrizio ED. Sharp beveled tip hollow microneedle arrays fabricated by LIGA and 3D soft lithography with polyvinyl alcohol. J Micromech Microeng 2006;16:473-9. Stoeber B, Liepmann D. Arrays of hollow out-of-plane microneedles for drug delivery. J Microelectromech Syst 2005;14:472-9. Davis SP, Landis BJ, Adams ZH, Allen MG, Prausnitz MR. Insertion of microneedles into skin: Measurement and prediction of insertion force and needle fracture force. J Biomech 2004;37:1155-63.